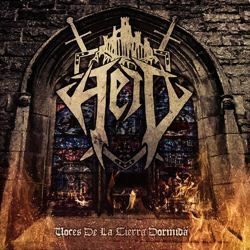 Heid is a new Spanish folk death black metal band from Madrid that has recently released its debut EP. The band was “officially” formed in 2012, even if the idea behind the band was one year older. In the beginning of 2013 they presented the 3-track demo “Heid” and on March 2014 they self-released their first EP “Voces de la Tierra Dormida“, both in digital format and in physical CD edition. “Voces de la Tierra Dormida” belongs in the category of works that grow gradually and reveal more secrets each time you listen to it, which for me is the most basic sign of quality in music. The EP includes only 5 songs, but its duration is over 28 minutes, so we actually get a good taste of the band. Heid have a quite personal sound, combining pagan black and death metal with Castilian folk music and instruments. Their sound is very solid and heavy with an excellent production, surprisingly good for a self-produced debut EP! Guitars are very dominant in their sound, with a very interesting balance between technical death and pagan black metal riffs. They are responsible for the rhythmic structures of their compositions, which often change from faster to slower or mid-tempo parts and together with the bass lines they give all the depth in their orchestrations. And while their guitars do not focus on melody, it’s the awesome use of local traditional instruments, like dulzaina (flute), violins, whistles, bandurria (mandolin) and mouth harp which adds a unique melodic folk touch in their music. The band has managed to combine these two different “worlds” in a very solid result and the use of Spanish language in the lyrics plays a key element in this “marriage”. Vocals are moving between pagan black metal screams and death metal growls of brutal nature, in harmony with the heavy aggressive sound of their music. The atmosphere of their songs is epic, dark and melancholic, far from the “happier” experiments of the folk genre, while my favorite song is the wonderful closing track “El Canto de los Responsos“. Heid is a band that exceeded my expectations with this great debut EP. Their folk metal is equally melodic and aggressive, with elements from both death metal and pagan black metal and a very professional, brutal, natural and interesting sound, totally recommended to fans of the genre. “Voces de la Tierra Dormida” is self-released in jewel-case CD including a 4-page booklet with all the lyrics and the beautiful artwork by Luis “Luigiht” Hermosilla. You can visit their official pages below for more info or their Bandcamp page in order to listen to the whole EP.